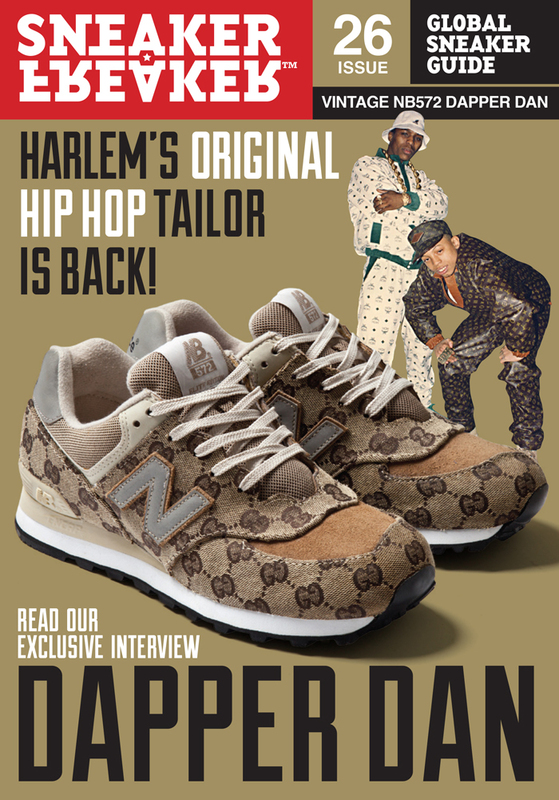 On the cover of Sneaker Freaker magazine last December was Dapper Dan. This was the man who unknowingly sparked a multi-million dollar industry! 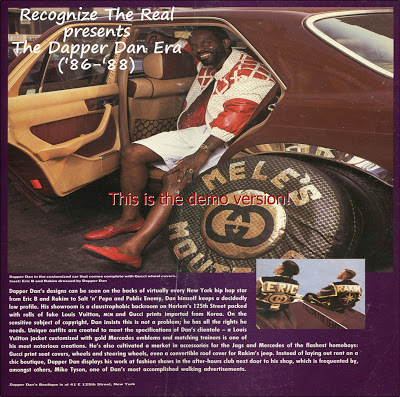 I say this because his custom designs using fake Gucci (and other high-end logos) were ahead of their time. And now every couture fashion house has a diffusion range targeting the urban trendsetter looking for a bit of swagger in their weekend gear. Here's the link to the Sneaker Freaker article - or you can scroll below. The video referenced by Woody has a great quote that captures the style of the era: "The stuff I did for Floyd (Mayweather) [holds up boxing shorts] is ostrich and mink, that's Royal black Africanism that hits the city..." Dapper Dan. 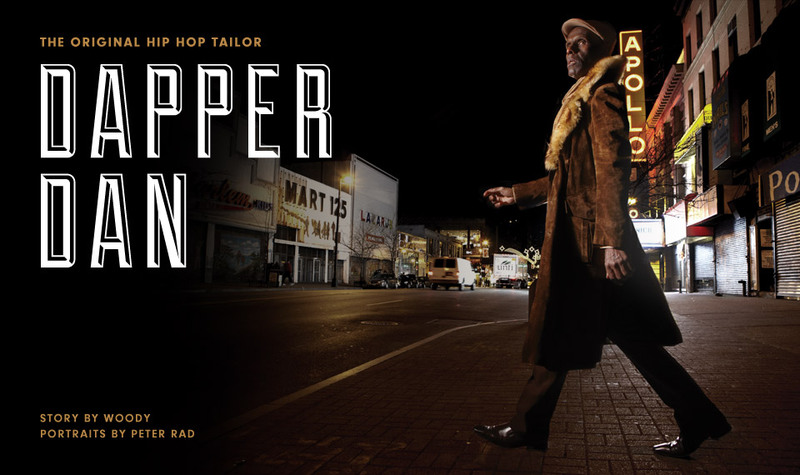 "From his eponymous store on E 125th in Harlem, Dapper Dan (real name Daniel Day) presided over a remarkable fashion emporium in the 80s and 90s. His uptown clientele was a heady mix of hustlers, street cats and hip hop royalty, all of whom shared a mutual love of what Dap himself called a ‘macho type of ethnic ghetto clothing’. That’s Harlem shorthand for streetified-luxury, a glorious melange of status symbols such as mink, ostrich, crocodile and python married with his own trademark ‘reappropriatons’ of Louis Vuitton, Gucci and Fendi yardage. 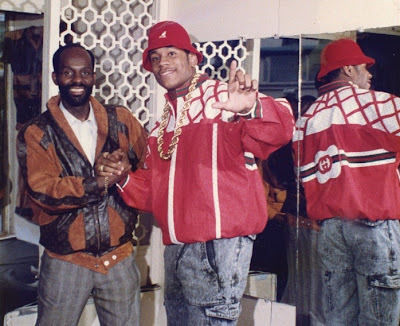 LL Cool J, Big Daddy Kane, Salt ‘n’ Pepa, Run DMC, Fat Boys and Public Enemy publicly repped Dapper Dan hard and his fame quickly spread beyond the local hood. Peep Eric B and Rakim’s Follow the Leader and Paid in Full for classic Dapper Dan outfits in full effect. 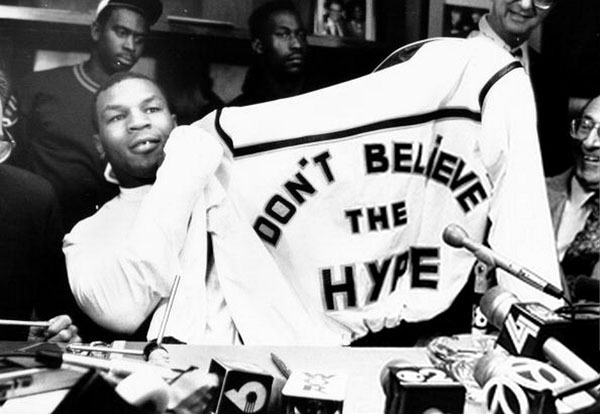 Mike Tyson famously punched out opponent Mitch Green in front of the store whilst on his way to pick up the classic ‘Don’t Believe the Hype’ jacket. The place became notorious. Fast forward. A few years back I scored a pair of sneakers that were purportedly made by the hand of Dapper Dan. At the time I thought I’d struck solid gold, right up until I was overcome by a niggling lack of proof. Could they be counterfeit Dapper Dan? The thought made me laugh. The shoes were well made and looked right as far as the era went, but all I had was a few random Google crumbs to piece together the story. Without any solid evidence of Dapper Dan tricking-out New Balances, they were reluctantly retired to the Sneaker Freaker archive. I had a feeling I’d finally get to hear their story one day. The only problem was that Dapper Dan hadn’t done an interview for 20 years. The trail was cold. Until now. Earlier this year Jay-Z’s Life+Times YouTube channel popped up with a brilliant interview to kick-off the launch of Dap’s new site, dapperdanofharlem.com. Still a natty dresser, hip hop’s original gentleman was back in the limelight and loving it. Charismatic and ice cool as ever, Dap swapped stories with his good friend Pee Wee Kirkland as they reminisced about Harlem and the good old days. It’s a contradiction, but Dapper Dan is one of street couture’s most influential and most mythical characters. 20 years of flying way below the radar might have dulled his stature amongst young folk who barely recall the previous day’s blog roll, but it has also bestowed an enigmatic, almost grandfatherly imprint upon his stage name. Judging by the recent hashtag trail, he is once again being name-checked and courted by the new school of New York street aristocracy. Dapper Dan changed fashion forever. In fact, his legacy runs deeper now than it did even at the height of his outré fame. Intimidated and threatened by the implications of hip hop’s glowing admiration in the 80s, the European fashion houses now actively court the affection of Pharrell and Jay-Z. The same brands that once tried to put him out of business now owe him a monumental debt. Kanye’s love affair with Louis Vuitton is just one example of how interconnected the two worlds have become. And those New Balances I bought years ago? Turns out they are Dapper Dan. Happy days. Enjoy the Dapper Dan interview. SF: How did you get started in the fashion industry? DD: I’ve always liked dressing and fashion, but I’m a guy from the street who didn’t want to be in the street, so I decided since I knew all the hustlers in Harlem that I would open up a store. In the beginning I was buying brands then I discovered that some companies wouldn’t sell to me. So I decided to teach myself how to produce garments. After that I learned different techniques and how to do things that nobody else was doing and that’s what took me over the top. 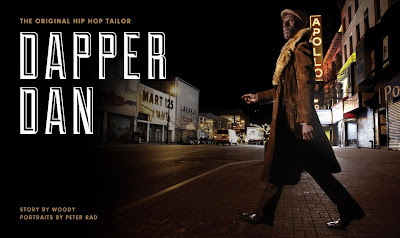 SF: How do you describe the Dapper Dan style? DD: I would attribute my success to making sure I was never defined. I would do what you would call personal collaborations. I’d tell a person what’s possible and how we can just mix it up. I never wanted to do like Cross Colors did or Karl Kani; being boxed in and noted for just one thing. I wanted everything separate from everything else. Each customer had their own idea and that’s what kept me around and generated excitement for so long. SF: What’s your take on Harlem style right now? DD: Right now it’s a bit challenged. We got our style from the older guys on the corner, but now, what’s happening is the younger set are influencing the older guys. They still want the things that Harlem always liked. Alligators and lizards and minks and things like that. That’s always a mainstay here, always popular, but the younger guys are experimenting, pretty much with that skateboard look, like Pharrell and Kanye. SF: Were you a hip hop fan or was it just fashion? DD: Well, you know what? A funny thing about my generation is we consider ourselves the first hip hop guys. They say hip hop started in the Bronx, but we were already doing it in Harlem. We would have house parties and somebody would come along and start MCing to get the party all pumped up, making up rhymes to go with the music. I would consider myself a hip-hop fan right away, especially with the exciting things the Fat Boys was doing and Jam Master J.
SF: It must have been cool to have those personalities coming in your store all the time. DD: Oh, yeah, it was great. My nephews and nieces who I had working around the store were very excited. SF: You mentioned mink and crocodile. Your reputation was founded on the way you adopted symbols from luxury brands and brought them into Harlem. DD: Well, you know, it was actually all about the bags. When Louis Vuitton bags was out and the little clutches, it was a status symbol. To give them more status you got to give them more of the symbols. So I said, you know what, maybe I’ll just make jackets and vests and pants and boots. Eventually that led to me doing car interiors and tyre covers for their Jeeps. But it was all about status. SF: I was always curious whether you saw any political significance in the way you used those symbols? DD: More importantly, I actually saw it as a challenge because I was shut out. I never thought that I would be accepted and I wanted to make a statement that I could do it. And on a street level, I wanted to make a statement that I could do the same thing that they’re doing, but even better, and it would be more attractive to my ethnic group and to the inner city people. It was also an opportunity to thumb my nose at those big houses that wouldn’t sell to me anyway, you know? SF: You got into a little legal tangle with those brands eventually though. DD: Yeah. They sued me, so I had to start all over again. I was getting too much publicity with Mike Tyson and all the rappers naming me in all the songs, so that’s why I went underground. SF: Did you see Kanye’s shoes for Louis Vuitton? DD: Yeah, I saw the red sneakers. I’ve been trying to follow him closely and I’m excited about what he’s been able to do. I hope I had something to do with him being able to be where he is today, as far as fashion’s concerned. least well-known element of the Dapper Dan story. How did you get started in footwear? Was it a customer’s idea? DD: In Harlem, we always wanted our shoes to match our jackets. So even in the very beginning, I got requests from guys to do sneakers. 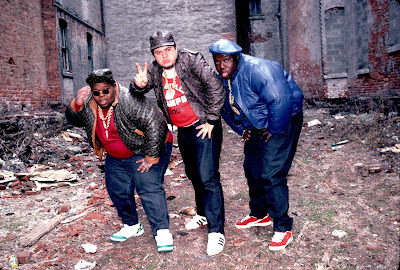 And if you look on the Fat Boys album cover for Crushin’ they got Gucci jackets on and the Nike sneakers with the Gucci on it. After that everybody wanted either their boots or their sneakers to match their jackets. Even the hustler who popularised it the most – Alberto Martinez, better known as Alpo, one of the main characters in the movie Paid In Full – had the espadrilles that matched his jacket. So, it’s a thing I always did because it increased the sale of the jackets. It had to be a top and bottom hit, you understand what I’m saying? SF: You gave those brands a different kind of fame, a street credibility. They obviously didn’t see any value in what you’d done for them. DD: They didn’t. They really, truly didn’t. They didn’t wake up until the other brands started seeing the impact of urban wear and how hip hop took it around the world. I’m happy for that and I’m happy for what’s going on now with Kanye and Pharrell working with the big houses that would not take me on early on, you know? SF: I do! What did you think when brands started to appear like Troop. DD: You know what? Troop did not have the status of Louis, Gucci, or Fendi, so it was never really popular in Harlem. It was popular outside of Harlem because of LL Cool J. Then the word went out that Troop was owned by a supposedly racist company (the KKK) and controversy erupted. When my shop was open, nobody was interested in Troop. It wasn’t rich enough and it didn’t send out the type of signal that my clientele wanted. SF: I always saw Troop as a mutant imitation of that luxury look, and I know LL Cool J was a customer, so I had to ask. Now, I bought a pair of New Balance 572s two years ago, and they were sold to me as Dapper Dan customs. I have never shown anyone these shoes. Did you make them? DD: Yeah, yeah, I did! New Balances was popular and I used to wear New Balances to jog in. New Balances was popular among a certain group of guys who wanted to break away from the norm. So yeah, we did a lot of New Balances for customers. SF: That’s funny, I’d have never associated NB with Dapper Dan til I bought them, but I’m glad they’re not a copy. How physically involved would you have been in making these? DD: Oh, I made them! We would buy the shoes or the customer would bring them in and I figured out how to cover them in fabric. I got a special kind of glue and I would take that glue, cut a pattern out to fit that sneaker and then we would glue it on. Then, to ensure that it would never come apart, I used the sewing machine to tack the fabric on. That worked out great. SF: This pair is from 1991 but it still looks in remarkable condition and I’m sure I could still wear them now. Your technique held up. DD: Yeah, we took our time. The special glue we used is the glue that was developed especially for the leather business. We were very successful at doing that. SF: I also wanted to know where you got the fabric from. Is that something you actually had made? DD: Originally we were getting the fabric by taking bags and garments and cutting them up. But then I came up with a way to print onto leather. And that’s when the business just went through the roof because Louis doesn’t print on real leather, even today I don’t think. So I was printing Louis and Gucci and Fendi on real leather. That was unheard of. And nobody could copy me, because nobody could figure out how I was getting the ink to stick. Even when you look at the interview that I did for Jay-Z’s Life + Times blog, I have a jacket that’s 25 years old and the ink hasn’t faded yet. After that I started embossing leather, way before the major companies were doing it. Now you see Louis Vuitton embossed bags. It was cutting edge. I tried to stay on top of the technical things that could be done with fabrics and stuff like that. SF: There’s a massive counterfeit Nike industry in China. They did the same thing you did, using LV prints on Nike Air Force 1s. Did you ever see them? DD: Yeah I did. Way back, there were these guys from a store in Chinatown in New York that would send people around to buy my jackets, send them to China to be duplicated and then bring them back. One of them even admitted it to me later on that he copied so many things that I did. I was familiar with what they was doing. I had a window, because the Chinese would copy what I was doing. I might make 700 pieces but they would make 70,000 pieces and flood the whole world. SF: What happened to all the jackets that you made, especially from that ‘80s period? They must be worth quite a bit now. DD: Yeah, absolutely. They’re collector’s items. 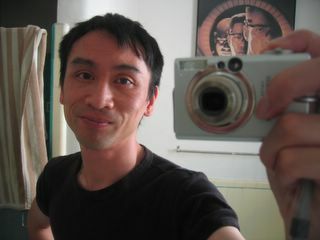 In fact, Bill Gates’ friend got in touch with me about buying some for a hip hop museum. SF: Bill Gates from Microsoft? DD: Yeah, Bill Gates. The billionaire. He put up some money and had someone go around to try and find original pieces that I made. SF: Thanks so much for your time. From everyone who’s admired your handiwork but never got to hear your story first hand, it’s been great talking with you. I’m quite chuffed that I have a pair of Dapper Dan New Balances. DD: Oh look, thank you for the interest you have in me and thank you for getting the story from me about what it was all about and where it came from. So I appreciate everything you guys are doing at Sneaker Freaker! Jon Reiss returns...Bomb It 2!